I'm just sitting here with my boyfriend, Earl Grey, perusing my article in the current issue of Artful Blogging magazine. Life, you never stop cracking me up. Back on the farm, I'd spend my pocket cash on an issue, now and then. I'd devour every article and the photography was so compelling, Cory usually flipped it when I was done. My stack of back-issues moved with me from house to house because they're bonafide works of art (along with Anthro and J Crew catalogs.) I'll never part with them. When the editor contacted me a few months ago about writing a piece for the magazine, I was thrilled. It was one of those private victories, a surprise remnant from my past life that showed up unannounced and made me grin my cheeks off. If you're interested, you can find a copy at places like B&N, Hobby Lobby, or Michaels. You can also subscribe. Just for the hay of it, I'm buying two extra copies with the discount Stampington & Co. armed me with, and I'm giving one away right here and one on my FPFG Facebook page. Because you guys are my homies, that's why. You tell me what face wash to use and where to find yoga pants to fit my wiry bod and what to read/watch/listen to. You cheer me on and up and jeez-Louise, I honestly don't know what I'd do without you. To enter, just tell me something good in the comments. Anything, as long as it's happy or wonderful or "fantastich" as Ruby wrote in a letter last night. I'll pick winners on Saturday (promise! swear!) so check back. Somethings good: tomatoes, feta, goat cheese, Gorgonzola, the word crostini, the idea of Indian Buffet for lunch (OK, now that you are a convert, we have to get you to Indian Garden in Mishy), new glasses, home to Ohio, the cats, suppose I should throw Rick in there, texts from my mom, working from home and watching four Amish girls cracking up HARD walking into Meijer, then seeing one of them still giggling to herself, grinning, three minutes later. Here's my fantastic ... I love thrifting, but after reading your fashion blogging, I stopped by Goodwill this week to look for some different looks. I got some long-sleeve Ts, couple of casual jackets. Didn't find any gingham yet, but I'm on the lookout. Now I just need to figure out how to get new looks from what I purchased. I plan on LAYERING. :) Happy Day! I'm so excited for you!!! Um - hello - totally one of my dreams. Yup, I just said it outloud. In public. Love it!! i'm a huge fan of that magazine, too! yay for you... so exciting!!! I think it's fantastich that one of your "pipe dreams" came true! Congratulations! I LOVE seeing dreams that God brings to life!! I'm ADDICTED to Stampington magazines! I would be THRILLED to win! Congrats, Shannan! You are a rockstar. I sent out an invite to 8 women to come to a retreat I've dreamed about for over a year. So far, 6 are in and I'm so glad I pushed that send arrow - it was scary! Trying to be brave this year and follow that still small voice. Shannan, I rarely comment, but you are by far my favorite blogger. You give me bits of joy whenever I see your updates. You deserve every good thing that comes your way! Best wishes. Go you! What a treat! My "fantastich": the hyacinth in my study just bloomed and the entire house now smells like spring, the predicted snow storm never arrived, and I caught sight of the neighborhood cat slinking through the meadow behind our house, whipping her tail, on the prowl. many weeks ago i told God that the next time someone gave me a starbucks gift card, rather than keeping it for myself - i would give it away. last night a dear friend gave me a LATE christmas gift - that she had wrapped more than a month ago - so - this morning i dropped said coffee card into the snail mail and sent it on its merry way to a friend who recently moved 2 hours away. Yay! Congrats Shannan, that's so wonderful! My happiness: my husband is coming home this afternoon after being in Louisiana this week for work. I'm trying not to stare at the clock too much. You are famous! I mean seriously...and how did I never know about this magazine? How wonderful for you to have a private dream come true...some days those are the best! Ones we are afraid to voice but secretly pray comes to life some day out in the future! Congrats on this, awesome news. :-). My good news is on Monday my foster daughter will be freed for adoption and we can start the process. :-) I would LOVE to win a copy of Artful Blogger. Thanks for the giveaway. Have a blessed day. I have never heard of that magazine but now you have piqued my interest. Something good? I am finally accomplishing my most procrastinated task: paperwork. I found your blog through Becoming: The Unfolding of You. Your video spoke to me and warmed my heart. Sounds like the unfolding never stops :) Congratulations on this amazing milestone and wonderful encouragement! P.s. how have I NEVER heard of this magazine?! Congrats! My good news is that my son asked a beautiful young lady to be his wife and she said yes! Also, learned that my daughter and her husband are expecting a baby boy! That really encourages me! What a sweet thing to see a dream fulfilled. Sunshine, BigSky Country, bible study, Christian friends, a wonderful community, encouraging blogs, work, and on and on. My something good for the day - my mama boldly spoke the truth in grace last week about some things going on at work to leadership, and had a follow up meeting this morning, at which she was anxiously thinking she would be asked to resign. Instead, there was good, productive conversation, the beginnings of healing, and recognition by others of their own wrongdoing. I'm feeling so proud of her today for speaking up, and for resting in God's plan for good. My step dad sent me home with rice pudding and home canned peaches... I get to surprise my kiddos with them at snack time. Congratulations! What exciting news! Something wonderful ~ I had a random lunch date with my Hubby and it included salsa and chips. Perfect day! Congratulations, I enjoy your blog,it truly is a blessing. I am always encourage and challenged. oh, girl. how special that God gives us the desires of our hearts, even when they don't seem important to anyone but us. He's crazy about you, you know. Awesome! Congrats! Sing it with me: "Tell me something good". I flew the cold Indiana coop solo with my kids for a few days of Vitamin D rich, sunshiny beaches in Florida. It's doing us a a lot of good. Led the FIRST contemporary worship service at our church last night! Eeep! It was wonderful and GOD filled! Oh wow, that's wonderful! That's a well deserved victory for you. Your beautiful writing should be in such a beautiful magazine. Gahhhh! SO awesome!! i would love to be in this mag!! Yahoo for you, girl! I don't know what to tell you about yoga pants. I'm wearing some right now and they stink and they're driving me cray. Read the Book Thief and listen to Serial on podcast. ASAP. I understand you can get tall yoga pants at Victoria's Secret and L.L. Bean. My 14 yr old Granddaughter is 6 ft tall and these really work for her. Keep writing, I'll keep reading. Look at you...SO proud of you, homegirl!! My great fantastic, over the top, thank you, LORD, news is that my daughter is back in college after a semester off!!! Congratulations! such a wonderful publication ~ you must be thrilled! will look for Artful Blogging tonight - having a coffee and book store read with my daughter. And my second comment here 'just in cases'. Isn't that just like God that you end up getting featured in the magazine not when you were living in the enviable, swoony farmhouse, but in the nitty gritty of your urban "ministry" family life! Congratulations! Lately I'm swooning over my new position over at the website I work with-- I get to be in charge of reviews/giveaways, finding cool stuff & getting it more exposure! Mmmmmmm. Cool!! I've heard about this mag.. but have never read. Something Fantastic? My three littles fell asleep.... Amen. Lights out.Three sweet kisses. Snores.... just like that!! It's gonna snow!! Our victory today was my oldest getting to throw out the "internal" headgear he's been wearing since last May. He can actually open his mouth around a cheese burger now. We did the happy dance to celebrate! We're happy for you too. Great accomplishment! I say..CONGRATS! , Never stop dreaming and our Heavenly Father truly does give us our heart's desires when we trust in Him! Giving a big ol shout out from a little holler in the tee tiny village of Valley Head, Alabama!!! Great news for you! My good news of the day (in our family we call it our "rose" when we play "Roses and Thorns") is my 12 year old placing in the top 10 in the county spelling bee. Here's something awesome that brought tears to my eyes this morning: Driving to my weekly mom group this morning (MOTTTS at Wakarusa Missionary Church; you should check it out sometime) ahead a ways I saw a police car pull in a driveway and turn around. I waited for his lights to turn on, wondering who he caught and for what infraction. Instead he pulled up to a teenager walking on the sidewalk. It was 8:45. This kid was walking towards school. In the cold. Late already. And still had quite a ways to go. The officer offered her a ride, and she gladly accepted. Man, even now, I'm tearing up again. I guess for me it was a glimpse of Christ reaching out to us, as we are walking in our mundane every day life, hanging our head in shame for oversleeping or missing the bus, or ... (insert sin here). And not scolding us or berating us, but reaching out to us, offering us a hand, a ride, an ear to listen, and a shoulder to cry on. This is forgiveness. Redemption! Freedom! Thank you, Jesus! Thank you! So exciting. I will have to get a copy. I had a good experience at the dentist today. my 6 year old daughter left me a post it note on my bathroom mirror telling me she loved me and she loved the way I 'drest.' it happened a few days ago and I am still glowing from it. I have never heard of that magazine - but you've got me hankering to check it out! I just found you. I joined JO's Becoming: The Unfolding of You, and was captivated by your story. 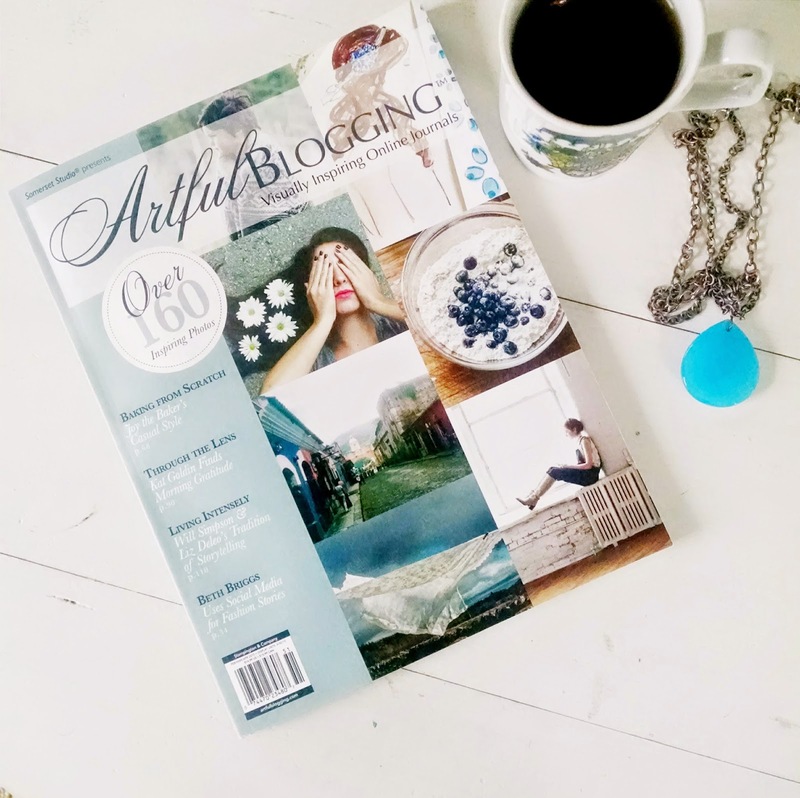 Artful Blogging is a great magazine though I don't buy it anymore because (1) i'm trying to be more frugal and (2) I haven't blogged since 2011 :-). But if I win it I'll read it cover to cover. Promise. This is wonderful news! I did not know such a magazine existed...what rock have I been living under? I must check this out for inspiration. After Saturday, of course, just in case, you know, I win a copy. Oh, and something good? I just discovered that our new church has a writers group. I'm so excited to check it out as that is the one thing I missed when I moved in 2012 - that group connection with other writers. I have never heard of this magazine but would love to look at it. Congrats. My Charlotte(8) wrote a letter in cursive last night to the President and said; "Dear Mr. President, I am very concerned about the trees..." She did it all on her own and then looked up the address and addressed her envelope in cursive as well. Sigh. My youngest, age 4 (who has CP as well as many traits of autism) remarked this morning, "Bubby (he used his brother's name) is Oscar the Grouch." This was great for a few reasons -1.b/c it was hilarious 2. b/c his brother was grouchy, 3. b/c he recognized emotion 4. b/c it was a five word phrase. It's the little things in life that make me happy. Yesterday he declared from the backseat: "G (his own name) believes in Jesus!" with such contentment and enthusiasm it made my heart swell. I don't know where he learned that exact phrase, but it reminded me that Jesus cares about my son. Wonderful today came in the form of a sweet friend loving on my nyc kid. thankful for community. An unexpected trip back to my parents house on the other side of the country...and having just been here two weeks ago! WINNING!! I love how God orchestrates things for our benefit. About a month ago my husband went to the store where we buy granola and, while talking to the owner, learned he was changing things in his store in order to become certified with the national celiac association. This week I learned I have celiac, and God provided a source for products before we even knew we'd need it! Also, it turns out my doctor has celiac and she was SO helpful in getting started. She was able to tell us which companies it's safe to buy from (no problems with cross-contamination) for things like cheese, milk, etc. Also websites where we could go for information. Since we live overseas, this is a huge blessing because we would not have really known where to start otherwise. I read this quote by John Piper the other day and thought it was so true - "There is more true joy to be found in walking with God through the fires of hell (trials of life) than in taking a walk on the beach without God." God just walked with me through a hard thing, and I'm so glad to be on the other side with much joy and thankfulness in my heart! I love how you can look back and watch your dreams come into view. Like they walked towards you as you held your belief to your chest. Congrats on the article! Yes please. And I'd like it hand delivered. Let's see. Something good. Well I got a good test result yesterday. My second in a row after a few not good results so am feeling relief and deep gratitude! A happy thought, it's Friday!!! Tomorrow is my oldest nephew's 5th birthday and I am so blessed to be his Aunt Kiki !!! Congrats on being published in the latest issue of Artful Blogging. No doubt about it, you belong between those pages on a regular basis. But more than that, you have inspired and encouraged thousands of hearts. Your blog speaks not only to the visual eye, but to the heart, and yes, the SOUL. Deep stuff. You spill yourself out into us, no filter, just raw love and courage. You show us how it's done, to be brave and step out into the unknown, all messy and beautiful at the same time. I can never say it too often, THANK YOU, for being you. THANK YOU, for loving us. It's all good. something good, you say...I just happen to have a B&N store credit from a Christmas gift return. Now I know the perfect purchase--Artful blogging and a cuppa chai to sit and savor both. How fun to see 'your name in lights!" Congrats on being published! You are a fav blogger of mine.... I love how your topics are all over the board, just like life is! Something good,,,, I have three healthy darling grandkids, with another one on the way! Congrats! I love pretty, inspiring magazines. I just discovered I can view some of my favorites for free on a site called ISSUU. YOU never stop cracking me up! So Soulful and Amazing! Congrats!!! Something good? The fig and goat cheese pizza with arugula I just devoured! I mean it...I ate the ENTIRE thing! I'd love to win! I am a newish follower here and just love all your home tour photos!! Oh my goodness, congratulations! It is a dream of mine to be published in any of Stampington's beatiful magazines, so I know you must be over the moon. As for something happy or wonderful, I can think of nothing better than the fact that we are all saved by God's beautiful act of love, shown by his death on the cross. No matter what the day throws at me, I remember that and know all is alright! Thanks for being an inspiration. Congratulations! This is a favorite of mine Stampington has the best magazines. I would love to be in one someday. So cool! Your blog is at the top of my Things I Love list. Also, I found today I'm getting a NIECE!